So it seems I was so sick that I reposted an article that I had already posted months ago. So here’s another blog post by Kostas. When it comes to personal finance, there are many problems that people experience. In fact, many individuals and couples find it very difficult to manage their finances effectively, which can lead to all sorts of issues. When personal and couple financial issues rear their heads, it is vital to take early action to avoid the problem getting any worse. Fortunately, there are various resources that you can turn to in order to do this. Couples’ finance is a very important issue in terms of ensuring everything continues to run smoothly. If problems arise with finances it can also lead to problems in the relationship, as money issues can create a huge amount of stress and puts couples under immense pressure. In this article, I will talk about some finance books that can help to guide you through. There are a number of tips that I provide for both individuals and couples who want to improve their personal financial situations, and I believe that books can be hugely beneficial. Many of the books relating to personal finance offer invaluable advice that is both practical and effective when it comes to improving finances. They can become a go-to guide for many individuals and couples, so they are always useful to have around if you want to keep your finances on track. · The Total Money Makeover: This book, which is by Dave Ramsey, is a guide that helps you back to financial fitness. The approach used is effective and practical, which makes it easier for readers to follow in order to get their finances into shape. In addition to this, there are various success stories that can provide you with inspiration and hope when it comes to money problems and debt. This is a book that really focuses on getting to the root of the matter, providing you with information on what you should and should not do in order to achieve financial fitness. · The One Page Financial Plan: In this personal finance book author, Carl Richards, provides a simple solution to being sensible about money. People often find it difficult to create a financial plan, and this can all be part of the issue when finances start to fall apart. With this book, you can develop an understanding of why you need to create a plan and how it can help you when it comes to your finances. You will come to understand how to prioritize effectively when it comes to money, which in turn makes it easier to make informed decisions. · Home Finances for Couples: Author, Leo Ostapiv, provides a wealth of information in this book, which is targeted toward couples who want to stay on the straight and narrow when it comes to financial matters. It is an excellent tool to help you to manage your finances effectively as a couple and avoid the pitfalls that many couples fall into when it comes to money. You can learn more about how to work toward shared financial goals and how to overcome money issues as a couple. · The Couples Guide to Income Power: This book is by Jason G. Miles and is all about showing couples how to increase their income, get rid of debt, and even retire at an earlier age. You will find a huge variety of valuable information in this book, making it a great guide for couples that want to benefit from complete financial fitness. If you have financial goals and are struggling to reach them, this book can be an inspiration. In addition, you can benefit from the step by step guide that makes implementing the strategies far easier and helps you to enjoy greater financial freedom. · The Couples Guide to Financial Compatibility: Author, Jeff Motske, clearly knows how personal financial issues can affect couples and result in arguments and even breakups. In this book, he provides information and advice that will enable couples to work together when it comes to both spending money and saving it. As a certified financial planner, the author has the expertise and experience to offer sound and very effective advice to couples that want to be able to put their money related issues behind them. · First Comes Love, Then Comes Money: Bethany Palmer, the author of this book, focuses her attention on the importance of communication between couples when it comes to financial matters. Many couples fall into financial ruin because of their inability to communicate over financial matters. However, this book provides invaluable advice and suggestions that will make it easier for couples to discuss and agree about issues that affect their financial situation as a couple. · The Heart of Money: A Couple’s Guide to Creating Tue Financial Intimacy: We all know that intimacy is important in a relationship. Well, in this book the author, Deborah L. Price, also focuses on the importance of intimacy when it comes to finances between couples. As a financial coach, she has helped many couples to overcome financial issues. This book is designed to provide the same benefit, with practical information that couples can implement. The one thing that these books all have in common is the ability to help individuals and couples make finances work for them. With the range of expert advice and step by step processes, you should find that getting your finances back into shape is not as difficult as you might have thought. Better still, the advice given in these books will help you to keep your finances in good shape. Every year, I get thousands of marketing pitches in my inbox. I often find that there are fewer than 10 are worth my time to readers. It almost makes me want to shutdown my email completely. … wait? You’ve heard this before? Yes, that’s essentially the same description of Digit, which I’ve been recommending for the last 18 months. Just two weeks ago, I wrote about how one can use Digit in the same way to save for the holidays now. So what makes Dobot different than Digit? Let’s review briefly what Digit is. Digit allows people to save money into one pool. It continuously saves money, a little each day. I’ve been using it for building a general emergency fund. I have had enough emergencies (new car brakes immediately come to mind) that keep it from growing too far out of control. I’ve written before that I’ve been saving money for this very extremely expensive television. I created a simple goal, “OLED 65”, “November 2017”, “$2500.” The most difficult part was trying to figure out what the cost of the television will be when I think it is a good value to buy. I’m not sure if the good value is $2500 as I like to find a rare bargain. I think that there might be a Black Friday deal next year with that rare bargain. While I just signed up, my understanding is that each week some money is put aside towards the goal. Since my goal is about 55 weeks away, I imagine that it will save around $45 a week, which would give me around $2500 by my target date. Dobot allows you to add a picture for motivation. Unfortunately, it wouldn’t let me bring in pictures from Pinterest or Amazon. I had to already have them on my phone. So I took a picture of my current Wal-Mart brand budget television that I want to upgrade from. Dobot is a very visual application, which is very different than Digit which works best by text message. In the coming days I will look to add some minor and major upgrades around the house. 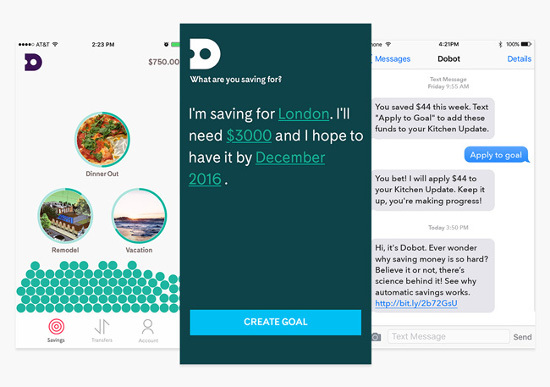 I see Dobot as a great budgeting tool. Some banks allow you to create sub-accounts for the same kinds of savings goals. Unfortunately, USAA required me to create a separate savings account for my OLED TV. It wasn’t a huge pain for one thing, but I certainly wouldn’t want to manage 20 accounts via USAA’s website. The downside of all this is that you aren’t going to earn interest. Some people may be upset with that. I see it as a non-issue given today’s extremely low interest rates. If I was getting 3-4% in my savings account, it would be a different conversation. Dobot is FDIC insured which is always something to look for. They say that they use bank-level security. That’s not overly convincing in and of itself. However, I know that these applications typically use the same bank-end banking engine like Yodlee. So many applications use this that the real risk is probably at Yodlee. I’ve been using these types of applications since 2006 and I’ve never heard of a hack. It might be more likely that your bank gets hacked. If you sign up from this link on the Dobot website, install the app, and add a bank account, they’ll fund it with $5. It isn’t a ton of money, but what did you expect in spending a few minutes to sign up for a free helpful, budgeting service? I’m not sure that you need both. Some people don’t even need one. However, I can see why people would use each of them. I’ll continue to use both, because I love to automate my money. Over the years, I’ve learned that the more forced savings I have, the more my net worth increases. I have a problem. It’s a “first-world” problem, so I don’t expect any sympathy. Father’s Day is just around the corner and my wife asked what I wanted. I honestly couldn’t think of much. I kind of want this Intel NUC to update our Windows Media Center that eliminates our cable box rental fees. The Dell Zino that I got 5 years ago is showing its age. Unfortunately, Microsoft discontinued the software to make it go, so I’m reduced to experimenting putting Windows 7 on it (not easy) or putting an experimental build of WMC on Windows 10 (also not easy). I don’t want to take on the project. I just want something that works. Other than this, the only other thing I can think of wanting is this extremely expensive television. Hey it only costs a fraction of the $25,000 that the technology cost a few years ago, so it’s a “bargain”, right? I don’t see myself saying, “I think it’s a good idea to spend $3000 on a television.” I’m just not wired that way. However, I realized that if I put aside a little money each month, it feels like an easier purchase. I saved specifically for it, so I can justify it. I’ve decided I’d put aside 1% of my monthly revenue each month. So if I were to make $60,000 a year (I don’t, this is just an example), it would be around $5000 a month. When I put 1% aside, I transfer $50 to a specialized account. That would be around $600 a year saved. So it’s going to take me 5 years to save up for the television, right? Well fortunately technology becomes much cheaper over time. In a couple of years, I wouldn’t be surprised if it was $1500 and I would have saved $1200 (in this example). I’d still be a little short, but here’s where the Father’s Day solution comes in. If my wife adds $50 here or there the gap is bridged pretty quick. It’s no big deal if it takes 30 months instead of 24. Budget for a big purchase – Some people just add it to their credit card and pay a ton of interest. Those people are not likely to be the ones retiring early. Motivate Me to Make More Money – Because I’m putting 1% away, the more money I make the faster I get to my goal. If I can grow from $5000 a month to $6000 a month, that means that I’m putting $60 aside each month. That would get me to $1440 after two years instead of $1200. I’ll reach my goal quicker and get the television quicker. Reward Me for Doing Good Work – This is kind of big thing for me psychologically. As I mentioned in the beginning, I don’t really want a lot of things. To expand on that, there aren’t a lot of experience things I want at this time either as it’s hard to do them with the 2 and 3 year old. All work and no play make Brian a dull boy, right? What do you do to motivate and reward yourself? Let me know in the comments. Weddings are so expensive, in fact, that even as the typical wedding involves fewer guests, the average cost for what’s typically a five-hour event has shot up to $31,213, as of 2014 according to a survey conducted by The Knot, a multi-platform wedding resource. And the price continues to increase. And when you’ve already resigned yourself to the fact that you’re supposed to spend tens of thousands to have your perfect day, what’s another couple of thousand on a groom’s ring, right? It’s almost too easy to want to spend money on your wedding; we see them as special, once-in-a-lifetime events wherein every item is a symbol, wrought with sentiment and meaning. However, many of the aspects of a wedding that we think of as long-held, important traditions are actually relatively new inventions thought up by the wedding business to make money. The diamond engagement ring – almost entirely a 20th century creation at the hands of De Beers and its hired marketers – is perhaps the most famous example. The groom’s wedding band is no different. While there is evidence of women wearing wedding rings back to ancient Egypt, research indicates that it wasn’t the norm for men to wear wedding bands before World War II. There are a couple of theories behind the birth of the two-ring trend: when men went off to fight in the second World War, many of them were said to have worn wedding bands to reminisce upon their wives back home. Other sources point to the growing gender equality between men and women — if the woman is wearing a ring, so should the man. Whatever the reason, jewelers were all too happy to take the opportunity to sell yet another expensive item to American lovebirds — and it worked. Yet, while men and women have taken great strides toward equality, the same cannot be said of our wedding bands. It is not uncommon for a woman’s wedding band to have a high level of artistry — diamonds and semi-precious stones, halos, eternity settings — while most men prefer a simple sliver of metal, which could be achieved easily by even the most novice jeweler. But because they both fit into that same “wedding” box, men will pay far more than what they have to for what amounts to an inornate band, simply because soon-to-be newlyweds approach the purchase with their eyes closed and their wallets open. 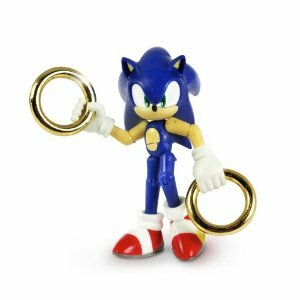 The bulk of the upcharge comes by convincing men to stick to rings made of platinum or gold if they want something that will last a lifetime. But the simplicity that many men want in their wedding bands offers the opportunity to go with a less traditional material that will be as durable — if not more durable — for a lot less money. One option that is particularly well-suited to the simple designs of men’s wedding bands is titanium. While it is very difficult to solder and thus not as great a choice for more ornate jewelry that might have to be re-sized, titanium is inexpensive to machine into simple circles of a given size. Moreover, titanium is biocompatible – meaning you won’t have an allergic reaction to wearing it – and less susceptible to tarnish and scratches than more expensive metals including gold. Another material that takes advantage of the relatively simple design of men’s wedding rings is tungsten carbide. This chemical compound is extremely hard so you wouldn’t be able to re-size anything made of it, but can be pressed into pre-determined shapes for a relatively low price. The resultant hardness means that tungsten carbide rings are extremely durable and very difficult to scratch. However, it is important to note that different manufacturers use different compositions of tungsten and carbon, with nickel and cobalt often involved as well, and that the different combinations can mean that these rings can differ greatly in physical properties. As always, read reviews to have the best idea of what you’re getting. Besides these two, jewelers also offer men’s wedding rings in any number of novel, inexpensive materials that include, but are certainly not limited to, ceramics, steel, meteorite, and dinosaur bone. Needless to say, with a little creativity and legwork you can find something meaningful that won’t break the bank – a welcome relief given the high cost of other aspects of getting married. The following is a guest post by Fanny Seto. She is the creator of Living Richly Budget Printables, a 20-page printable bundle and budgeting system that makes it 20-seconds easier to stick to a budget. She is also the Editor-in-Chief of Living Richly on a Budget, a personal finance blog. I met Fanny when I was living in San Francisco and she’s a smart, smart woman. I realize that printable budgets aren’t for everyone, but if you are going to go that route, I’d recommend picking these up. They are gorgeous. Many people start budgets but they don’t seem to stick with them. Why is that? Because they’re lazy? I think it’s because they don’t have clearly defined goals. Are you trying to pay off debt, save up for a house, or build a college fund for the kids? What is the exact amount of your goal? Once you set your goals, then make it easier to follow through with budgeting. The idea is in order to make it easier to form a new habit, you make it more convenient for yourself by placing the tools you need within reach. Make something 20 seconds faster to get to and you’re more likely to do it. For example, to make tracking expenses easier, you use a worksheet that has budget categories and the date already filled out so that all you have to do is fill in a number. Then you place it on the wall next to your desk or wherever it’s convenient for you to fill it out. Use the 20-second rule for managing money so that you’re more likely to do it. Some of these are obvious but they’re good reminders on how to make budgeting and saving automatic. Once your systems are set up, you can be lazy and not feel guilty about it. 1. Set up autopay for recurring bills and debt payments. This is a no brainer. If a utility or other business offers autopay, do it! Not only will you not have to think about paying those bills every month, but you also save on checks and postage. 2. Automate savings from your paycheck. Set up savings to be automatically be deposited from your paycheck, before you spend it. Otherwise you’re likely to spend that amount on something else. 3. Use a budget with categories filled out for you. I like low-tech when it comes to budgeting. I use Living Richly Budget Printables, a budgeting system that I created. to stay on budget. With a printable budget, I can post this on the wall or fridge to remind myself to stay on target. Even though everything is online nowadays, I don’t always have time to turn on the computer with my toddler running around. Having a worksheet on my desk, makes it 20 seconds easier for me to fill out and keep up with. 4. Track expenses with pre-filled expenses and date. I used to use Mint. However, I found that since it’s done for you, when I check my expenses, it’s a little too late. What’s spent is spent. What I mean is that when I actively write down my expenses, I tend to spend less. Since I know I have to record my spending, I am more conscious about spending. It’s a guilt trip thing that works. Again, I like to do this on a worksheet, the Daily Spending Log (part of Living Richly Budget Printables) since it’s easier to access without having to turn on a computer. And the categories correspond to my budget so after the month is done, it’s easy to transfer the numbers to the monthly budget. 5. Keep a list of monthly and non-monthly bills and when they’re due. Ideally, most of your bills will be set up on autopay already. It’s also a good idea to have them listed on one sheet with the day of the month they’re due. This way you can be prepared for them and you won’t have to dig through a pile of bills to figure out the due date. 6. Store credit card and bank logins in one place. Managing multiple credit cards and bank accounts can be overwhelming at times. Put all of your login info in a secure place so that when you need to pay bills or check balances, it’s 20 seconds easier to get to. There are some things I use cash for to really adhere to a tight budget. Groceries and eating out and get out of hand. With cash, you’re limited to what you have. Once it’s spent, it’s spent. Other things I will use a credit card to pay for like gas. This way more convenient especially if you have kids.